The first mass-production electric pickup truck is nearly ready to hit the road. 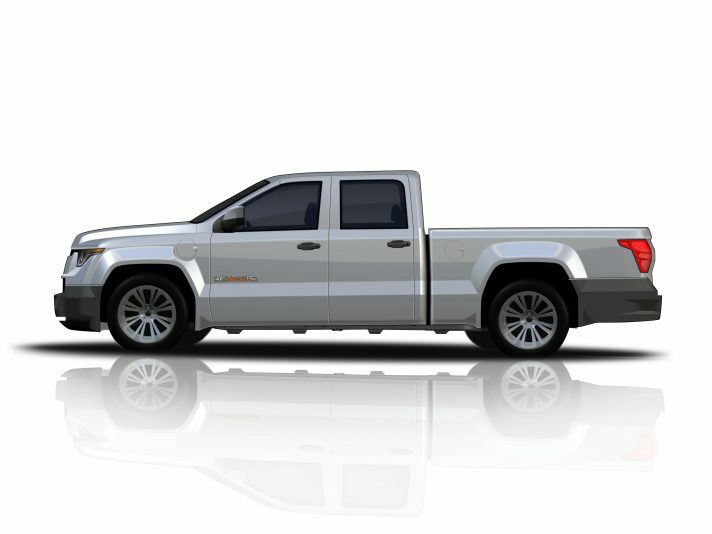 Workhorse Group Inc. released images of the production version of its W-15 work truck, showing a finished design only slightly different from the prototype vehicle Trucks.com drove in 2017. Workhorse will begin production of the truck for early testing in the late summer or fall, said John LaFleur, business development manager for Workhorse. Large fleet customers may take delivery in late 2018 and full production will begin in 2019. The company is finalizing its supply chain network and will conduct final assembly of the trucks at its plant in Union City, Ind. Differences between the concept and the production W-15 are subtle. Compared with the prototype, the finished version will have a lightly modified chassis and small design changes. Some lines around the headlights and taillights have been smoothed out. The rear windows are flat along the bottom instead of angling sharply up at the corners. Front and rear bumpers will be a different material than the rest of the body. The small front grille has a cleaner integration into the bumper design. The flared wheel arches on the concept have been toned down for production. “It was over-exaggerated on the concept to give it a strong look,” LaFleur said. “We wanted to streamline it a little more. The concept W-15 featured a double cab design with tight rear seating. Some of Workhorse’s large fleet customers asked for more space, so the production W-15 will be lengthened. The finished version will be about six inches longer than a double cab and slightly shorter than a true crew cab in order to preserve the 6.5-foot bed, he said. The integrated light bar on concept car’s roof will be available as optional equipment on the production W-15. 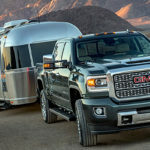 Standard equipment will include running boards, though they may differ on trucks intended for commercial fleets and those purchased for personal use. The same goes for wheels, tires and some other features. “We’re going to try and make this truck relatively the same for consumers and a commercial vehicle,” Lafleur said. For instance, there may be interior differences between commercial and consumer trucks, but both versions will feature a large touchscreen that displays vehicle information and can be used with work gloves. Standard safety equipment includes automatic emergency braking, lane departure warning and blind spot monitoring. A 360-degree camera and backup camera will be standard on commercial trucks and possibly standard on consumer vehicles as well. Since there is only a small range-extender engine under the hood, Workhorse built a large front crumple zone for protection in the event of a crash. The core powertrain components in the prototype will carry over to production. The W-15 is all-wheel drive thanks to an electric motor on the front axle and another on the rear. The two motors combined make 442 horsepower. Power comes from Panasonic lithium-ion battery cells arranged in a pack between the rails of the frame for better safety and a low center of gravity. The truck has an estimated electric range of 80 miles, with a 1.5-liter, three-cylinder motor from BMW that increases range to 310 miles. Workhorse also uses BMW motors of the two-cylinder variety in its electric delivery vans. The capability figures listed for the concept will be the same for the production version. The W-15 is expected to have 2,200 pounds of maximum payload capacity and 5,000 pounds of maximum towing capacity. “Everything is benchmarked to compete with an F-150 or Silverado 1500 – that’s what’s driving our minimum capabilities,” LaFleur said. The company has just under 6,000 orders for the W-15, not including customers who placed $1,000 refundable deposits for a consumer version. “We want to make sure the vehicle is living up to the expectations we’ve put forth,” he said. I wonder if that 3-cylinder REx motor will be able to recharge the battery at the rate of charge depletion one might expect in a utility vehicle. I know BMW struggled with that issue in the i3 under circumstances such as depleted battery, heavy load, and long inclines. The REx motor just couldn’t keep up and the vehicle would precipitously decelerate . They are claiming it does. Even up the largest hills in the West it will not deplete its battery. I have done the calculations. I have watched F150’s pull 12k lbs up the largest hills at 3000 to 3500rpm. The 375HP motor in the 3.5EB Ford only makes about 250HP at that rpm plus elevation losses of 20-30% due to atmospheric pressure drops. The F150 is using maybe 200HP to pull 12,000 lbs up a 7% grade for 8 minutes up one of the largest hills in the US. Pulling 5000Lbs with 2200Lbs of payload; the electric motors only need about 30-600HP on flat ground and climbing big hills, maybe 150HP, then it recharges going down the hill and when stopped. The generator kicks in when the batteries have 20KWh of energy left. There is no situation where you can burn off 20Kwh of battery power under the safe loads given to this truck, especially not when the generator is adding to the 20Kwh available on kick in. What is the production capability of the manufacturing facility?